Ulrich Scharr (1828-1881) and Phillipine Wentz Scharr (1837-1921), both natives of Germany, were the parents of twelve children, eight who survived into the 20th Century. Ulrich Scharr came from Wurtemberg while Phillipine Wentz was born in Bavaria(Hasloch, Reinpfale). By 1857, the Scharr family was residing in Nelson, Buffalo County, Wisconsin where Mr. Scharr farmed. This area of west central Wisconsin, which borders on Minnesota, is still sparsely populated. In 1870, Ulrich Scharr possessed real estate valued at $1500 and his personal estate was worth $1200. The Scharr’s had five children at this time: John Scharr (1857-1944); Rosa Scharr (1862 -1935); Theodore Scharr (b. 1864); Louisa Scharr (b. 1866); and Pauline Scharr (b. 1869). (1870 Wisconsin Federal Census, M593R1704, p. 121) Ulrich and Phillipine had three more children: Minnie Scharr (1871 – 1954) m. Habersaat; Joseph U. Scharr (1874 – 1954); and Lillian “Lilly” Scharr (1877 – 1952). Joseph worked as a foreman of a signal crew for the L&N Railroad until his retirement in 1940. He was active in the Masonic Lodge, serving as Most Worshipful Master and helped with the construction of the current Masonic Lodge now located on the corner of Government and Bellande. After retirement, Joe served one term as an alderman for the City of Ocean Springs. Joseph passed away at his home on November 4, 1954. Lenora remained active in the Ocean Springs Methodist Church until her death in January 1962. The Scharr’s were buried in Evergreen Cemetery in Ocean Springs, Mississippi. Mary Elizabeth Josey was a native of Laurel, Maryland, and the daughter of Elias B. Josey and Pharoah Lewis Josey. Their children were: Mary M. Scharr Hayes (1929– 2000) and Brenda Fair Scharr (b. 1945) married Thomas E. Bounds III (b. 1944). In January 1964, Ellen married Raymond C. Easton (1885-1977) at Long Beach, California. She had been introduced to him by several cousins who lived in Montana. Mr. Easton was born May 10, 1895 at South Haven, Minnesota, the son of Alexander C. Easton. Following military service during WWI, Raymond settled at Gardiner, Montana where he was employed at Yellowstone National Park. He had married Amanda Stave (c. 1907-1963) at Livingston, Montana in 1927. 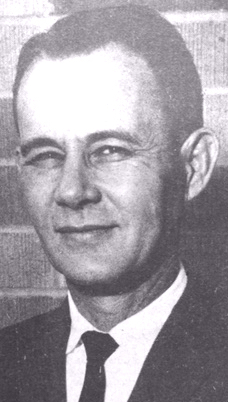 Mr. Easton retired as acting postmaster at Gardiner, Montana in 1957. He and Ellen relocated to Livingston, Montana in 1970. He expired here in the fall of 1977. Ellen S. Easton died April 1996, at Livingston, Park County, Montana. Elinor Wright was a native of Whittier, California and the daughter of John C. “Jack” Wright (1879-1941) and Florence Hunt (1875-1961). Haralson Lafayette “H.L.” Hunt (1889-1974), the Texas oil tycoon, was her uncle. Elinor and her family came to Ocean Springs from southern Illinois, in 1919, where her father operated at dairy and pecan orchard in what is now the Maurepas Landing Subdivision. Orwin and Elinor W. Scharr were the parents of: David O. Scharr (b. 1941); Andrew J. Scharr (b. 1943); and Roberta Elinor “Robin” Scharr Allen (b. 1947). The Daily Herald, “Ocean Springs”, June 7, 1924. The Daily Herald, "Scharr in Marines", February 20, 1934. The Daily Herald, “Webb-Scharr”, May 10, 1935. The Daily Herald, “Scharr-Garlotte”, November 6, 1939. The Daily Herald, “Schaar-Wright”, 1940. The Daily Herald, “Mrs. Scharr Dies”, February 14, 1953. The Daily Herald, “Schaar Funeral”, February 1953. The Daily Herald, “Schaar-White”, 1954?. The Daily Herald, “J.U. Scharr Dies”, November 9, 1954. The Daily Herald, “James L. Clarke”, August 21, 1961. The Daily Herald, “Clair Scharr”, August 4, 1972. The Daily Herald, “Merrill (sic) F. Scharr”, October 26, 1977. The Gulf Coast Times, “Death Takes Beloved Elinor Wright Scharr; Funeral Rites Held Monday”, February 14, 1953. The Gulf Coast Times, “Hilda Friar Wed To C.U. Scharr”, May 16, 1953. The Gulf Coast Times, “Mr. And Mrs. J.U. Scharr Celebrate Golden Wedding”, June 25, 1953. The Jackson County Times, “Local and Personal”, September 14, 1929. The Jackson County Times, “The Column”, September 29, 1934. The Jackson County Times, “Scharr’s Garage”, October 28, 1939. The Jackson County Times, “Dickey-White”, March 22, 1941. The Jackson County Times, “Pan-Am Service Station Sold By Phil Wieder”, February 4, 1949. The Livingston Enterprise, Raymond C. Easton”, November 3, 1977. The Livingston Enterprise, “Ellen S. Easton”, April 29, 1996. The Ocean Springs News, “Mrs. Lenora Scharr”, January 18, 1962. The Ocean Springs Record, “Mohler’s Goes Independent”, March 5, 1992. The Sun Herald, “Mrs. Mary Elizabeth Scharr”, April 6, 1990. The Sun Herald, “John Webb”, October 8, 1998. The Sun Herald, “Ruth Dickey White Scharr”, August 23, 2000. The Sun Herald, “Lucile Amy Webb”, July 24, 2001. The Sun Herald, “Orwin J. Scharr”, August 9, 2002.